Accelerated sea level rise (slr) is expected to transform vulnerable Atlantic coastal habitats in the United States during this century. Low-elevation sandy beaches, important nesting habitat for the continued recovery of the federally threatened piping plover (Charadrius melodus) in Rhode Island, are especially vulnerable. These beaches, under a mix of private and public ownership, exist in a heterogeneous landscape of dunes, rocky headlands, salt ponds, and heavily developed areas. Understanding the extent to which piping plover nesting beaches can retreat landward under projected slr is important for prioritizing future conservation actions across multiple jurisdictions. 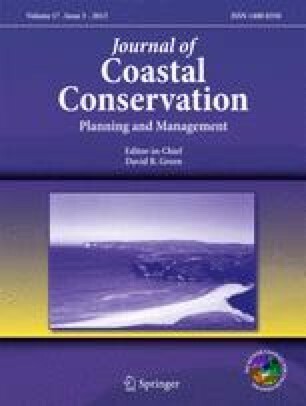 This research examines habitat change in response to slr (0.5, 1.0, and 1.5 m) under stationary and migration beach responses and whether development blocks habitat migration for five productive piping plover nesting beaches. We found that under the stationary habitat model, all beaches lose area under all slr scenarios. For the habitat migration model, future habitat availability differs by beach depending on elevation, landward topography, and presence of development. However, across the majority of beach area, piping plover habitat will be able to migrate landward if unconstrained by future development. A coalition of public and private stakeholders already supports management efforts to help ensure plover population recovery in the area. With emerging habitat change prediction tools, these stakeholders and other partners can engage in innovative, local-level planning needed to protect wildlife habitat and commercial, residential, and infrastructure assets from sea level rise. We thank The Sounds Conservancy for its grant in support of this research. We also acknowledge and thank the piping plover management personnel at the U.S. Fish and Wildlife Service, Rhode Island National Wildlife Refuge Complex office in Charlestown, RI, USA, for sharing nesting data and providing logistical assistance. Special thanks go to Dorie Stolley, Erin King, and Jessica Cressman. For guidance in modeling-related statistics, many thanks to Michael Sutherland, PhD, Professor Emeritus, University of Massachusetts, Amherst, MA, USA. Thanks also to James Jordan, PhD, Core Faculty, Antioch University New England, Keene, NH, USA.